The War Report. Entente vs. Central Powers. Turn 1. Late September. 1914. This is an AAR of a PBEM game from the perspective of the Western Entente and possibly the Eastern Entente, in a grand war against Ajarnlance in his role as the supreme command of the Central Powers. My intent for this AAR is to mostly have a stated record of what happened, it is also to help me remember what my war plans and strategies are, to also keep me accountable to my fellow players. I also enjoy writing and even though these AAR's take loads of time, I love finding pictures and newspaper clippings from the time when the events of the game are happening. This is my second game against Ajarnlance, as the first fell apart do to a series of incidents. But never mind, with any luck, this one we shall fight to the bitter end. As it is the first turn in a non-historic game, there is only one action we can make. That is, to commit to a War Plan. I have chosen the French War Plan XIX, the Luxembourg invasion. The reasoning behind my choice is that the Kaiser really only has two decent options; the Schlieffen Plan and the Moltke Plan. If I play the Plan XIX and the Kaiser chooses the Shlieffen Plan, I set myself up to flank or hold up the German invasion with strong armies already near the Ardennes. If I play the Plan XIX and the Kaiser chooses the Moltke Plan, I set myself up to widen the existing Western Front with objectives near my grasp. Either way, compared to my only viable option, Plan XVII, I believe it sets me up better to deal with those two more likely German Plans. I would consider Plan XVII as a slightly safer, lower risk, lower reward Plan, more primarily orientated towards defense. It only allows for two breakout points and both of those are over rugged hilly terrain, the most important of these, Mulhouse (due to being one of the only railway lines connecting France to Germany), abuts against a river, which could be quickly reinforced and would stop my advance fairly quickly. I understand my Ally in the East has chosen the Historical Option for Russia. I believe that is a good choice, as playing as the Eastern Entente, one must be very careful to not expend and National Moral points, and I believe (I could be wrong), nearly every other option drains Moral. I believe the Kaiser will choose the Schlieffen Plan, 2-1 odds I think. Of course, nothing is certain, but I think it is more likely he will choose the Schlieffen Plan. I am not concerning myself overly much with Austria just yet, as of yet, they are no threat to us in the West, and therefore their initial deployment does not matter to much. This concludes War Report. Turn 1, Late September, 1914. For the record, I am the EE player. I confirm that I chose the historical plan, mainly for 2 reasons. 1. It's the one that has the best disposition against any German attack (well in theory) 2. It doesn't cause any NM lost to either the EE (very important) or WE (important). The initial plan was to preserve NM at any cost, and to contain the Germans, and if possible go on the offensive against the Austrians, without suffering too many casualties. War Report. Turn 2, Early September, 1914. A tragedy has happened, my guess of initial German deployment was off the mark by a good bit. The Kaiser chose the Moltke Plan. The tragedy is not one of warfare, as in fact this puts me in a decent position on the Western Front, but it is a tragedy of art. Because of this I will not be able to find historical newspaper clippings that apply to the game. I will be able to post a clipping of the fall of Brussels, or the Battle of the Somme and have it accurately reflect what is currently going on in the game. It is a shame and a tragedy. But militarily it puts me in a good position! My armies, poised in the Ardennes, will fling themselves on Luxembourg and up along the river Mosel. Trying to outpace the Germans and secure the whole riverfront while at the same time strengthening its fronts in Alsac-Lorraine with anything that we can move there. Unfortunately, diplomatically that leaves us further behind then if we had chosen Plan XVII. Britain has not joined the war because Belgium was not invaded, and because we invaded Luxembourg, that leaves us further behind still. Therefore we must send our Major Diplomat to Britain, to improve our relations there as quickly as he can. The Entente has decided that we would split the remaining minor diplomats. Therefore, the Tsar has requested that we send his diplomats to Romania and Bulgaria. Which leaves us a little lost as to where to send the Western Entente diplomats, we decided that Portugal would be one one, as they are heavily leaning in our direction already, the second I placed on Belgium. They have a sizable army and could benefit us quite well in the war. France stands alone, yet she must do her part in this war. France will quickly gain territory behind the Mosel River, yet she must also reinforce the existing and the newly conquered territory as quickly as she can. Therefore, against my free market capitalist nature, we are printing funds. Most players of this game insist it is necessary. But I read a passage somewhere saying that "It is necessary at the start, and near the end of the game." My logic tells me that if I do not inflate the currency at the start, there should be no need to inflate it again near the end! But regardless, I will go with the way most players play it, and save the experiment for some other day. We are also recruiting as many troops as we can. We need to toughen up our borders quickly, or at least, make them seem as tough as we can. 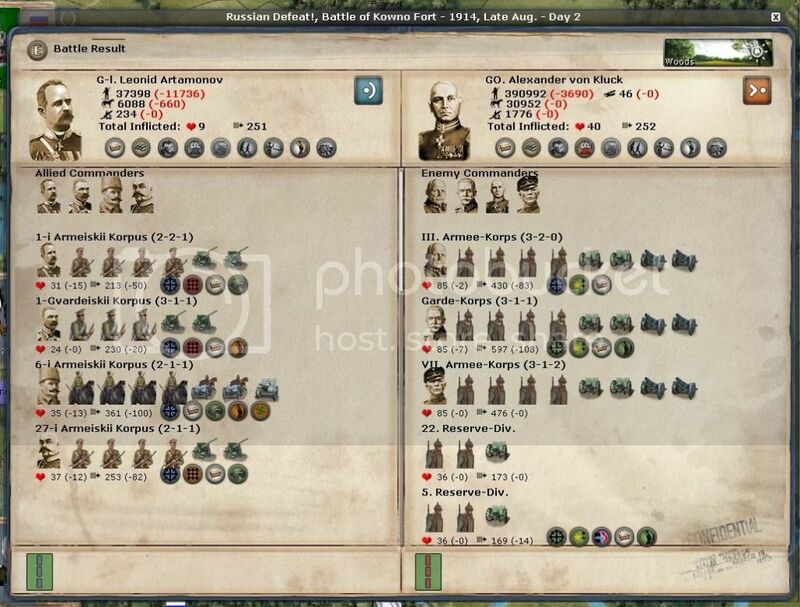 To do this, I think using the least resources to maximum combat power ratio would be recruiting infantry. However my armies may be under equipped with artillery, I need bodies in those trenches quickly. Over the winter we will build artillery, but right now we need to gain ground, and hold it at all costs until the winter. This concludes War Report. Turn 2, Early September, 1914. The War Report. Turn 3, Late August. 1914. These reports will vary in length and verbosity depending on current sleep acquisition and the number of issues to report on. I would like to post every turn though. The quick strike into the northern parts of the Rhineland so far is successful. Armies move into the territory, wresting military control from the Germans territory by territory. Commander Foch failed to hasten his troops in a forced march to Bonn, and the enemy got there first. So in this upcoming few weeks, he has been ordered to make a tentative attack against the forces arrayed in front of him while the Premiere Army moves up behind him to secure Trier. Along our southern fronts at Alsace-Lorraine, French Corps hasten to fill the gaps in the front lines and dig trenches to secure their positions. Britain's alignment has shot up to 89%, with any luck, it shan't be too long before they join the war. Hopefully before the Ottomans join the Central Powers. We have printed state funds. Using those funds, we recruited all of our field artillery, and used up all but 7 conscript (points? 7 thousand men? I wonder) on Infantry Divisions. Within two months we will have vastly increased our presence on the front lines. Although, in effect, they will be cannon fodder until we can support them by building more artillery. With the presence of Austrian ships in the Shipping lanes in the Mediterranean, we are sending our Merchant ships to the coast of Africa. Bad weather in the sea, has severely slowed our Battlefleets from gathering together and arranging a strike against the Austrian fleet. With skillful deployment of my Merchant ships next turn, we may be able to lure the Austrian ships into a position where we can more favorably attack them with our Mediterranean fleet. Meanwhile, the Germans turn their forces on Russia and push into Russia and Poland, suppressing three cities of the Russian peoples under the boot of the Kaiser. Hopefully, we can eliviate some of that pressure by our push into the Rhineland. This concludes The War Report. Turn 3, Late August. 1914. PJL wrote: For the record, I am the EE player. I confirm that I chose the historical plan, mainly for 2 reasons. 1. It's the one that has the best disposition against any German attack (well in theory) 2. It doesn't cause any NM lost to either the EE (very important) or WE (important). Grand! I was wondering who it would turn out to be! Feel free to post your own reports! It is the only way really to stay in touch over the distance. Also, I concure on your choice for a warplan. It makes good sense. I have been following all the AAR's, very informative with interesting insights into the game, looking forward to this one. I am looking for a Partner to play Britain. Life at the moment is VERY busy, I work in the oilfields and often my work can be quite hectic. In these last four days I've had to be at work by 5am at the latest and don't get back home until at least 8 PM. Between that and what little time I have with family, I would be swamped if I took on Britian without slowing down the game or stopping these AAR's. I also think large games with many players look like a lot of fun! So if anyone feels like they want to tackle the British for me, I'd be pretty happy! I expect them in the game next turn I think. I would like the player to be have played the Western Entente before, because the blockading and shipping can be complicated. Beyond that, the British player will have a free hand to deploy their troops wherever they wish, and to mount any expedition and landings wherever they choose. Wether it be assisting me on the Western Front or any other Front of their choosing. By request to a designated "Leader"
Or, I note my resource gains currently, and declare that this will be my allotment assigned to the French every turn, and bank it or spend it as I see fit. In regards to Diplomacy, If you like you can have the major and the minor diplomat on Portugal. But it doesn't really matter. For events it would get tricky. How would a person allocate resources to events and tech? I'd have to ponder it. Anyways! Anyone interested just PM me. Having seen the initial German deployment, we were dismayed. We were hoping for it not to be the Moltke plan, though after hearing previous wargames using the Schrieffer Plan, the Kaiser decided to try for something different this time. So we tried to prepare for the onslaught the best we can, and moved Rennenkampfs army towards Kowno, a lone corp towards Riga, and Samsonov's army to Grodno. As everyone else in Russia was stll not ready to mobilise, there was little else we could do. The lack of available rail stock did little to help either. We moved the Baltic Sea & Black Sea navies to Petrograd and Rostov respectively (as far from harm as possible), with the exception of the 2 submarine squadrons in the Baltic which were sent to the Baltic shipping box. As far Serbia was concerned, some unit reorganisation was made, but very little was done. Putnik remained in charge of the Belgrade defence. We filled up our replacements as best we could, though there's never enough war supply for the heavy artillery. We also built some militias to fill out some of the armies to their max element limit. For the time being we did not use state funds, as to preserve NM. We also advised the EE on where some of their diplomats should be posted to. So the onslaught against us began, Rennenkampf army was decimated despite being ordered not to put up more than a token resistance. Indeed Rennenkampf himself was injured while trying to go to Minsk to receive authorisation to become an army commander. Meanwhile Samsonov's army which was delayed going to Grodno due the lack of rail stock continued to move in that direction. Samsonow himself failed to get to Minsk to get his own army commander authorisation either due to miscommunications. On the Austrian front, now that the army there had been mobilised was to persue a limited offensive against them, essentially since there was little else they could do, while rolling stock was limited. Serbia remained quiet, with some reorganisation as more units were mobilised. We continued to build the odd militia or so, plus replacements. Again we decided not to issue state funds. One small piece of good news though, the subs we sent to the Baltic are now reducing CP state funds and war supply by 4 each (that is 4 SF & 4 WS per turn from the whole sub force). I would offer but I would just be dead weight. Hope you can hold off PJL till Jinx enters Berlin. Further death and destruction was wrought on ‘Rennenkampf’s’ army, now headed by Artamanonov (and now renamed 8[SUP]th[/SUP] Army, which barely made it out alive from Kowno as it moved back to Grodno. Considering the mauling it received, it has been ordered to move back to Brest Litovsk. Germany also continues to move along the Kowno-Minsk railway, with Wilna now besieged. Meanwhile the newly remaned 2[SUP]nd[/SUP] Russian army was ordered to move from the Lubin area to Grodno to cover any flanking moves by the Germans there. Similarly forces have been deployed in Riga in anticipation of any German moves there. Samsonov’s army has been deployed to Minsk (as will Rennenkampf and Samansov once the trains run on time). Elsewhere, the limited offensive against the Austrians continue, though no major engagements have been made. In Poland another German offensive has forced our forces to retreat from Lodz, with any defences there being little more than speed bumps right now (other than Warsaw). The Serbian front was quiet. Money became scarce at this point. With this in mind, it was decided to print money regardless, and to continue to do so at every opportunities despite the loss of faith in the economy this would receive. Battle at Kowno (there were more, but this was the most serious one). Thanks, I think the worst is over for now, in that I can now move and reorganise most of my forces. Thanks for the screenshots! It's the best way to keep up to date. The thrust towards central Russia will fizzle out once he starts loosing supply. Two turns and I bet he will stall. A shame that there where no attacks into Serbia! That's a good place to maul the Austrians. Lance is trying a very defensive game on all fronts except yours. PGL, I don't know if its too reckless for your situation, but I like to unlock fortress guns as Russia. I figure if they help me to even the odds, against the better equipped Germans, they will earn their morale cost back. Jinx wrote: Thanks for the screenshots! It's the best way to keep up to date. There is a good sized Austrian corps across the next to Belgrade (equivalent to a Serbian army) so I'm wary of any attacks there. But I might do some feints elsewhere if there's an opportunity. To be honest, I'm so focused on Russia at the moment, I'm almost forgetting about Serbia. TXcavalier - Given the NM and VP penalty, I am wary about unlocking fortress guns, not sure how much gain I would get from such a penalty. And even if got them, there's the problem of getting replacements for them (artillery WS is prohibitively expensive for Russia, especially the heavy guns the forts would use). The War Report. Early September. 1914. Commander Foch suffered a defeat with high losses trying to break into Bonn. Last turn he was only three days march away, and it was a worthy risk if we could extend our line along the river and with the railway line. Unfortunately, the enemy railed in his troops and we suffered a defeat at his hands. This is the only battle waged this turn. But we must press on and gain territory and cause a stir in the West to ease pressure on the East. So I refitted Foch into an oversized Corps and turned him around to march north, to secure the woods there. I hesitated to march him all the way to Aachen, because I may cut myself off as I did in the last game. Especially with few troops to spare to reinforce the woods behind him in the face of the army now stacked in Bonn. But I am sending him north to the woods to ready march into Aachen and possibly Essen next turn. I need to push into Germany proper to use up their manpower trying to keep up with my extending front. I darn't risk any attack where I do not outnumber the enemy by a healthy margin, as Germany has more and better artillery then my French corps and would win nearly every battle unless I have at the very least a 1.5-1 superiority. At the moment, I do have a slight upperhand and as soon as my troops get shifted into Trier I can rapidly advance and secure my rear, while still having an army of equal numbers to face the Germans in front. But for now, a cautious advance, to better leap over the river next turn to Essen. On the Alsace-Lorraine Front, I am shifting any forces I can spare to the North Rhineland, also, if Germany also sends troops North, I think I may launch an attack from our southernmost border with Germany at Mulhouse in about 4 turns, I will prepare an army for that venture if it looks feasible. We ordered a few more troops and some artillery, and with the remaining moneys, we purchased some much needed generals. This concludes the War Report. Early September. 1914. The War Report. Turn 5, Late September, 1914. Britain has joined the war! I was not expecting this until the possibly Early October, so I am caught a little on the back foot and needed to request a little more time to do this last turn. I also looked into getting a partner specifically for Britain, to take a little off so I could spend some more time doing such idiotic things like actually sleeping. We found a fellow to play them, although he is fairly new to PBEM's and even EAW, so, we will have to put it on trial. I don't want to play a game where I double check my partner for any blunders, I'd rather play them all myself in that case. The war rages on. Although very quite on the Western Front. I am making no drastic attacks where I do not have a clear advantage, and the Kaiser bides his time in a defensive stance tempting me to attack him. I shall choose instead to outflank him. The only battle this turn. We suffered a stupid Battle in Trier. In a sleepless haze of last turn, I wanted some action that wouldn't result in defeat, and the pesky city of Trier was resisting, so I set the stance to all-out-attack, thinking it would be a fairly simple battle. I should have waited, it is not as if I was moving that army anywhere within the next few turns, so I could have calmly waited until the city surrendered and have had virtually no casualties. Now I've damaged my army and it sits in a weakened state. Still strong enough to repel any attack (I think), but it needs a brief rest to recover. In the meantime, the whole Northern Rhineland is buzzing like a beehive. General Castelnau's army moves north, in a 16 day march to attack Koeln, Commander Foch makes a 14 day dash across the river to attack Essen with his large Corps. Armies and Corps will file through Luxembourg to Trier, to form a second full sized army under General Dubail to stand opposite of von Bayern Army in Bonn. I have a gut feeling the Germans will attack across the Mosel river this upcoming turn. Red being more likely, and Yellow the least. The combat power displayed on the two red areas are all there is on those provinces. If they do end up attacking, I may be able to MTSG, and throw them off. If they win, I can probably send two Corps back from Trier to reinforce neighboring positions or see if I can include them in an attack of some kind. Also note my cavalry circled in green, that division, and one just like it further to the north, are cutting rail ties to further distract and slow the enemy in their redeployment's to the North. Last turn, the Germans also sent a division of Cavalry into my territory, but they have since disappeared and are probably already cutting railway ties somewhere in my territory. I tried to catch them with two divisions of Cavalry of my own, but we lost them anyway. I issued more state funds to deal with the flood of new conscripts from Britain. This should be about the last time I have to do so I think. I wanted the British Player to use all the funds available, but he didn't get my message in time, and we needed to send the savegame on to the host. So I used a tiny bit in reinforcements and am saving the rest for next turn. I switched our Major Diplomat from Britain to the Italians. We fired off the Anglo-Japanese event, and Japan should join next turn. I also tagged the event giving HMS Erin and HMS Agincourt to the Ottoman Empire. If we can hold off the Ottoman Empire for joining, for each turn that works out to be [I have no clue] of Money, Conscripts, and War Supply. If we can hold them off for even two turns, that would be a nice loss to the Central Powers. As for the third event. We will fire that off after the Ottoman Empire join the Central Powers, as it gives a 5% loss to their alignment with us, and would be counter productive to keeping them out of the war for a little longer. I'm baiting the shipping box in the Mediterranean with my merchant ships. Next turn I will swoop in with my French battlefleet and hopefully catch the Austrians as they try to catch my ships. This concludes the War Report. Turn 5, Late September, 1914. PJL wrote: There is a good sized Austrian corps across the next to Belgrade (equivalent to a Serbian army) so I'm wary of any attacks there. But I might do some feints elsewhere if there's an opportunity. To be honest, I'm so focused on Russia at the moment, I'm almost forgetting about Serbia. I'd be interested in a screenshot of Serbia sometime, have the Austrians made any move at all? At the very least you are distracting a few of their troops from joining in on the battles in the North. Whats the maximum entrenchment level in Serbia? 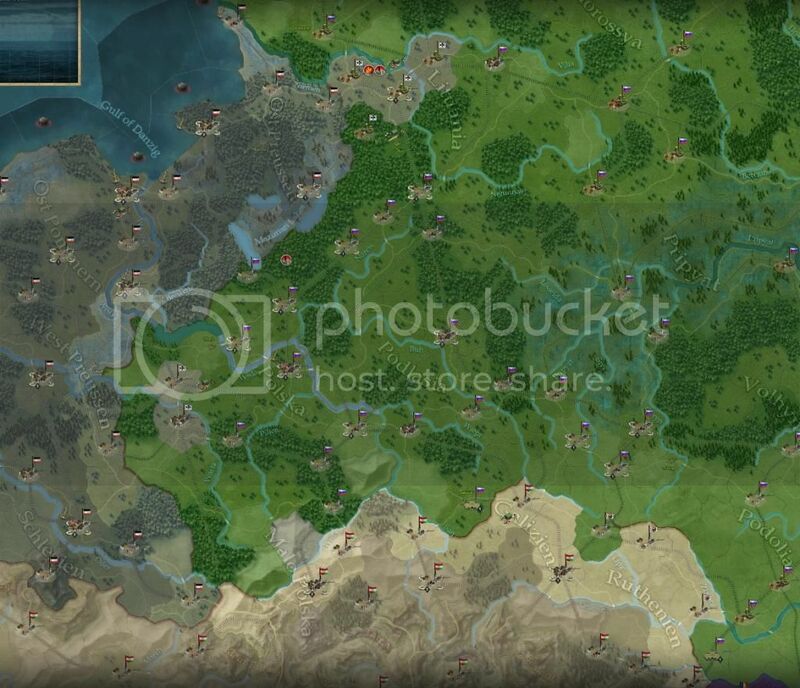 Jinx wrote: I'd be interested in a screenshot of Serbia sometime, have the Austrians made any move at all? The entrenchment level is the same for Serbia & Russia (I think it's done per side rather than any region). I would be very wary of any invasions near the German coast. Not so much of the minesweepers (though that surely is a factor), but like you said, because of the rail network in Germany. And also because of the High Seas Fleet too. To be honest, it would be like making a full frontal assault at the front door. Much better to hit them at weak points. Like Cattaro for instance (no rail head, near friendly territory, no major Austrian navy there). Disaster at Wilno. In an attempt to save the garrison, the force tried to sally forth and evade the besieging army, only to be slaughtered to a man. (OOC, I wanted to save the force there, but forgot that defensive posture automatically converts to offensive when you move besieged units inside the structure outside). Although we were expecting the force to be destroyed, the fact so few of the enemy was killed was disappointing. Elsewhere, 2[SUP]nd[/SUP] army was defeated trying to defend Grodno, though they weren’t defending strongly, as we had no idea of the force that was heading there. The enemy subsequently destroyed the garrison there. So losses were light, and the force retreated to Bielostok. Meanwhile, the Germans continue to advance in Poland, and are now at the gates of Warsaw, which is being defended by 6[SUP]th[/SUP] Russian army. With the extra funds, we could now increase our replacements accordingly. We built some more militias to fill up any gaps in corps stacks remaining, both Russian & Serbs. NM is now 93. Navy – the subs are still sinking German merchant ships carrying iron ore from Sweden as well as German exports to there. (4 SF & 4 WS sunk each turn still). The War Report, Early October 1914, Turn 6. The weather has decimated our cohesion, or maybe it is our orders that decimated them. Commander Foch made a daring march across the river to the city of Essen, and won a daring victory against the German Corp that had railed in. In the process his cohesion has fallen apart and his troops are fatigued. He may most likely not be able to hold the territory next turn, and in fact, I believe the Kaiser will counter-attack. This is the only battle this turn. We have decided to try rail our Corps in Aachen across the river to Essen/. We do not exert military control over Essen yet, but it will be a fifteen day march, and if during those fifteen days the control over the territory passes on to the Entente, the Aachen corps may arrive in Essen a lot quicker to reinforce them in any upcoming battle. It is our hope to hold Essen, as supply within the North Rhineland territories gained may hinge on holding it. Also it will serve as an excellent breakout point into Hessen. The Deuxieme Army suffered extreme loss to cohesion and we have rerouted them from their attack on Kohen to reinforce Aachen. Kohen will probably be reinforced to a point we can not take it with this army, and sending it to Aachen will let us protect our gains there. The rain has rolled in and swamped parts of the North Rhineland in mud. Supply has not been an issue so far though. But this serves as an early year reminder to start gearing up for winter. Japan has joined our fight against the Central Powers. I believe we still cannot land Japanese troops in the European theater, so me will use their forces to take Tsing-Tao, although, they will quickly go out of supply. Why did they give only one supply cart if those troops are locked in? We have ordered some more French Generals, we may need them to take on Corps in the North Rhineland. Again we try using up all our resources in Troops, and Artillery, mostly French. The British are amassing in Malta, for a strike against Austria, this will take a couple turns to complete. We hope by early January our troops will land in Cattaro. This concludes the War Report, Early October 1914, Turn 6. "Mon centre céde, ma droite recule, situation excellente, j’attaque." ~ Ferdinand Foch, in the defensive actions to prevent a German breakthrough in 1914. The War Report, Late October 2014, Turn 7. Disaster and defeat in Essen, many troops have been captured and killed and the rest where routed. The Corp from Aachen managed to arrive to partake in the slaughter. Our forces fled in retreat across the Rhein and into Aachen, where again they where forced into battle. Then the Deuxieme Armee arrived in Aachen and attacked the German forces, which resulted in a terrible victory with disproportionately high losses to the French. This left us decimated in Aachen, with a German presence in the territory and our forces weak within the city walls. To reinforce and hold Aachen, we sent the Première armée to rapidly march North to Aachen, hopefully to be on time for any battle the army in Aachen may face. General Foch and his Corp is being sent south to Trier to stock and resupply his forces. We received a glut of French troops, and are sending them all to Trier to build a brand new army there. Our recruitment orders this turn have been slightly limited, due to the fact that we have recruited all the French Regulars that we can get and have filled all our recruiting stations. We instead built brigades of Engineers, Doctors, Pioneers, Telegraph Crews, Marines in Britain, and a few artillery pieces in the few places we had available in France. The British forces have mostly unlocked and are being shipped to Malta, except for the Indian troops, who I will use to capture Africa. I send my merchants back into the shipping boxes in the Mediterranean and send a British fleet to protect them, although, they will need to go to Egypt first to resupply. The Japanese fleet has also headed to the Mediterranean. These last few AAR's have been a bit late. I went to go visit a friend a two hour drive to the North in Alberta, and then a blizzard rolled in and I was stuck overnight. So I missed a turn and fell behind on writing the AAR's I had planned for my day off. The War Report, Early November, 1914. Turn 8. This will be a very brief report. The Première armée made it to Aachen in time, and although we suffered a defeat, we successfully reinforced the City. We will most probably not be able to hold the city, also our cohesion will drop as are being besieged. We will hold for one turn before we break out and move south to Trier. We suffered a defeat in the Pacific, a cruiser was lost. But we are sending our Japanese fleet to target the German Navy and try to sink this annoyance in the Pacific. In the Rhineland, we move troops north to reinforce Aachen. We have moved our diplomat from Portugal (at 97% ENT) to Holland (at 49% ENT), although, I think we may move that diplomat to Norway, Sweden, or Denmark. Our British Indian Troops are landing in Africa and will do battle in five days. Our British forces assemble in Malta, I think next turn we will move those troops to off the coast in Cattaro in Austria. This concludes the War Report, Early November, 1914. Turn 8. Yikes! Your first battles on turn 7 both had river crossing penalties. I cringe when I see that for my side. Its going to be lopsided and bloody. PGL, how are you doing? Ajarn's screenshots make the Russian situation look good for the Central Powers. TXcavalier wrote: Yikes! Your first battles on turn 7 both had river crossing penalties. I cringe when I see that for my side. Its going to be lopsided and bloody. PGL, how are you doing? Ajarn's screenshots make the Russian situation look good for the Central Powers. I'm afraid I did my fair share of cringing as well. I'm not entirely sure why Foch's Corp has a river crossing penalty. He was defending in Essen and only crossed the river when he retreated to Aachen. These last few turns have been pretty terrible. I played a risky move in order to take Essen, and now I'm paying the price. The worst of it is, that I'm trying to be sufficiently aggressive in order to attract more Getman troops to the West. I think I've succeded in a very small way, but at great cost. So! Fun fact! A British submarine CAN slip through the Kiel Canal. It's a little useless in the Baltic, as its cohesion is shot to bits. But it's good to know, also, it may have served to distract Germany while I transported troops towards Malta. Is that because they were yellow submarines, I believe they can go where they please. Have you started buttering up the Italians? BBBD316 wrote: Is that because they were yellow submarines, I believe they can go where they please. Yes indeed, they are well on their way to joining the Entente, I believe they are at 59% Entente.